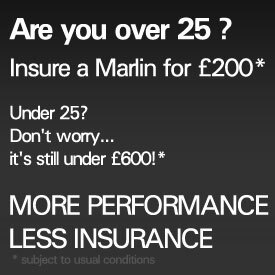 For Sale Marlin Sports Cars .. Stress problem in a few Cabrio's. .. Owner Sportster build - as seen in ..
Born to be wild -watch this video : ..
and the winners are......... .. WIN 2 tickets for Stoneleigh Kit sh ..
National Kit Car Motor Show .. Welcome to Marlin Sports Cars – a small company with a big reputation. As a specialist British manufacturer, we design, build and sell sports cars that stand apart from the mainstream. Our innovative design, high quality manufacturing and after-sales back-up has earned us an enviable position in the market. We are, for example, one of a small group of specialist sports car manufacturers, along with Morgan, TVR and Caterham, to be listed in the British motor industry bible, the Glass’s Guide. Marlin has produced unique, exciting sports cars, fully-built and in self-assembly form, at its Devon factory since the mid-Nineties. For those with more traditional tastes, there’s the Marlin Sportster, with its unique mix of classic roadster styling and sophisticated BMW performance. It takes the exhilarating nimbleness of the Caterhams and Westfields and fuses it with the roomier, touring car appeal of classics like Morgan. Being a specialist, bespoke manufacturer means Marlin builds a sports car the way it should be – just the way you want it. So as well as choosing colour and trim details (anything from a stripped-out trackday car to a luxurious leather-trimmed tourer), you can also talk to us about engine options and suspension set-ups for road, trackdays or motorsport. The Marlin 5EXi is a modern, lightweight, mid-engined sports car powered by various VW models. With its spaceframe chassis, up to 450+bhp, and independent wishbone suspension, the Marlin 5EXi is a modern alternative to models like the Lotus & MG style cars. And it regularly gives them, and more expensive production sports cars like Ferraris, Porsches, Caterhams and Westfields a run for their money in the prestigious GT Championship at Castle Combe circuit. We have been active in motorsport for some years now, developing our cars, promoting the company… and having fun including supporting the fabulous new Marlin produced Avatar race car avatarsportscars.co.uk in the Castle Combe Special GT Championships. Enjoy looking around the site. And if you want to know anything about Marlin, the company or the cars, do please get in touch.